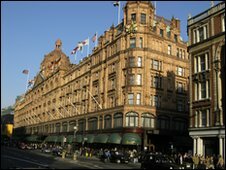 A group of scouts say they were turned away from London department store Harrods after refusing to remove their neckerchiefs and woggles. The 1st Bordon Scout Group, from Hampshire, were in the capital to take part in an annual event. 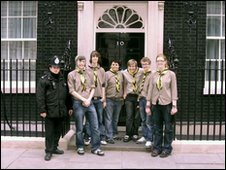 But as the group of about 10 explorer scouts and their leader went to visit the store they were refused entry. A spokesman for Harrods said although it had no record of the incident, the store apologised "unreservedly". Scout leader Paul Kosinski told BBC News that wearing the uniform was part of his identity. Mr Kosinski said the party had offered to break into smaller groups, but were still told by security they could not enter because of their uniforms. Mr Kosinski said: "To my horror they said we were going to have to take off our neckers and woggles. "I said, 'definitely not', I'm a scout and it's part of my identity. "We're scouts, we're one of the most respectable groups in the UK. What would Baden Powell think of this?" Mr Kosinski said he wanted the luxury store to review its policy on uniforms. A spokesman for Harrods said its customer service department spoke to Mr Kosinkski when he complained and it started an investigation. He added: "Whilst we have no record of the incident in question, we apologised unreservedly to the scout leader if indeed the scouts were asked to remove their neck ties. "We also reiterated our store policy in relation to groups visiting the store and explained this is done in the interest of the majority of our customers, which he accepted." In February Ukrainian football team Shakhtar Donetsk were turned away from Mohamed Al Fayed's store - two days before playing his Fulham team. The players were wearing squad tracksuits. A Harrods spokesperson said the footballers were denied access for "health and safety" reasons and no offence was meant.